Tons of Flavour Fresh or Dried! There are numerous varieties of thyme, with common thyme (thymus vulgaris) being the variety you'll find most often used, dried and fresh, in kitchens all around the world. With its origins in dry climates, it has been a staple of Mediterranean and Middle Eastern diets from Spain to Iran. And with its strong flavour it's ideally suited for heavy, rich foods, and is used to flavour game, meats, stews and root vegetables. But it's also ideal for lighter dishes, and is often used with tomatoes and egg dishes. And, of course, no bouquet garni or herbes de Provence would be without it! Thyme herb is one of the best for retaining its essence, and a little can go a long way. Unlike a lot of herbs, it retains its pungency once dried and is comparable to fresh, and can be used as a whole sprig including the stems, or just the leaves. Read more about the plant. It's also slow to release its full bouquet, so is often added early in the cooking process. The chemical inside common thyme, thymol, has many antiseptic, anti-bactrerial and anti-fungal uses. Herbalists have used it to ease fevers and infections. It has also been used to encourage sleep, to calm muscles and aid digestion. Today, it is most often used to help any breathing problems from coughs and asthma, and to help with digestive complaints. As thymol is such an excellent antiseptic, it's also a key ingredient in many household items, including mouthwash, toothpaste, and pot pourri. Read more on the benefits and uses for thyme oil. If you don't have any oil, making a homemade tea out of the leaves is a traditional cure for sore throats and mouth infections. Click for my thyme tea recipe. The roots of this basic herb stretch back into antiquity and this woody shrub was once used by ancient Egyptians as part of the embalming process. However, it was the ancient Romans who first saw its culinary value, adding the chopped leaves to cheeses and beverages for its rich aroma. It was burned in temples to purify and strengthen the soul, and this association with bravery continued into medieval times, when knights carried bouquets of thyme to strengthen them on their quest during the Crusades. The evergreen perennial thyme plant grows best in a sunny, hot corner of the garden and all it needs is well-drained soil. It tolerates both drought and deep freezes, and is a very hardy plant. 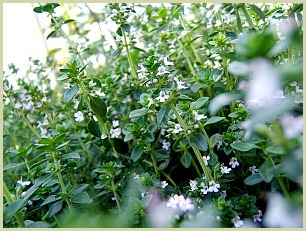 For detailed info and advice on growing this plant, see my growing thyme page. Sweet Basil Herb - The Tastiest Basil of All! Parsley - The Most Popular Herb in the World!